An addon is a collection of coded actions you can use within any test. It’s all stored in TestProject’s collaborative addons library. Addons are shared by the entire community and give you the power to effortlessly extend your recorded and coded tests and save valuable time. TestProject automatically analyzes the elements in your application and suggests addons that can enhance your tests. 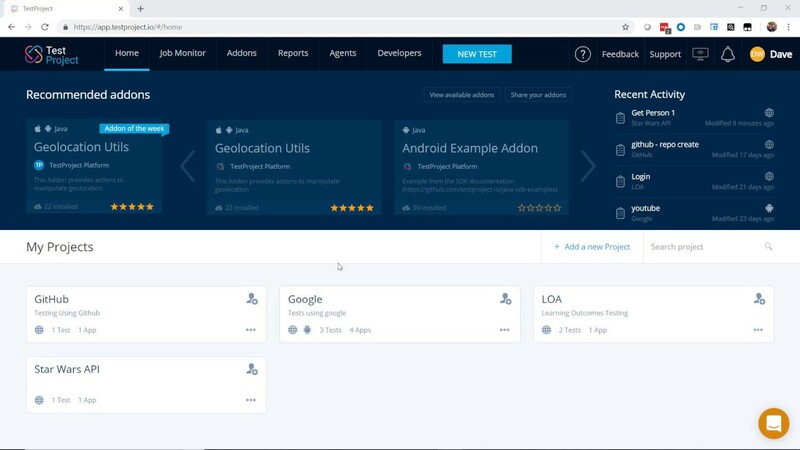 In TestProject’s addons library you will find useful addons that are rated by community users and categorized by Web, Android and iOS platforms. This addon provides actions to send HTTP/S requests using GET, POST, PUT and DELETE methods. A wrapper for Java library to generate random data for all sorts of things. Actions for finding elements in scrollable containers. Provides actions to grant or revoke Android permissions for the application under test. Provides actions to send Slack messages. Execute any ADB shell command on Android DUT. Manipulates date and time objects.